Hong Kong – Naxos was launched in 1987 as a budget classical CD label, offering CDs at the price of an LP at a time when CDs cost about three times more than LPs. The focus was on recording the standard repertoire in state-of-the-art digital sound with outstanding, if unknown artists and orchestras, initially mainly from Eastern Europe. From these humble beginnings, Naxos developed into one of the world’s leading classical labels, recording a wide range of repertoire with artists and orchestras from more than 30 countries. Naxos releases about 200 new titles per year, offering many world première recordings but also instalments of huge complete works projects such as the complete piano music of Liszt and the complete symphonies of Villa-Lobos. The Naxos catalogue now consists of more than 9000 titles of mostly unduplicated repertoire recorded in state-of-the-art sound by well-known artists and orchestras, prize-winners and other rising young stars. The label features many series targeting specific national markets, none more important than its American Classics whose composers, orchestras, conductors, soloists and producers among them have won 19 GRAMMY® awards. Stuart Skelton, Simon O’Neill and others. In a video interview with Klaus Heymann, Music Director Designate of the New York Philharmonic, van Zweden had this to say about this important undertaking: “I am enjoying this [journey]. I want to thank Klaus for having the courage, in the times we live in now, to do this [Ring cycle] with us… I’m so proud of this project.” Das Rheingold was released in 2015 and Die Walküre in 2016, both to great critical acclaim. Siegfried was recorded in January 2017 and will be released in November this year. Parallel to the growth of the label, Naxos built a worldwide infrastructure for its own and most other independent classical labels. It offers these labels a wide range of services ranging from physical and digital distribution and logistics to marketing and promotion, licensing, royalty administration and collection of public performance royalties. Naxos also has brought a number of independent classical labels under its umbrella offering them its infrastructure while maintaining their artistic independence. Among these labels are Capriccio, Dynamic, Ondine, Orfeo and 13 others. Naxos is also the industry leader in the digital presentation of classical music. In 1996, it made the complete catalogs of Naxos and its sister label, Marco Polo, available for streaming, the first labels in the history of the industry to do so. In 2002, the company launched Naxos Music Library, the industry’s first subscription streaming platform, four years before the launch of Spotify. Since then, streaming platforms for jazz, world music, spoken word and audiovisual productions were launched. The Naxos online libraries are used by thousands of educational institutions and music professionals around the world. They offer not only music listening but also a wide range of reference material including an interactive music dictionary, pronunciation guides, guided tours and many other resources. Beyond these libraries Naxos has made big investments in music education ranging from books with CDs to e-books and apps. The hardcover My First Classical Music Book has been published in 10 languages and the App based on the book has been one of the most successful ever in classical music. The Naxos Music Group will celebrate the 30th anniversary of the launch of Naxos with events in Munich and London, including a gala concert at the Court Chapel in Munich featuring Naxos artists Boris Giltburg, Tianwa Yang and Gabriel Schwabe. A limited edition box set offering 30 CDs selected from the vast Naxos catalogue has been released worldwide. It offers landmark recordings from the 30-year history of the label. Celebrating 30 years in 2017, Naxos has evolved from its beginnings as a budget label to a leading classical music group. Headquartered in Hong Kong with distribution and marketing subsidiaries in fifteen countries, the group distributes its Naxos, Naxos AudioBooks and Marco Polo labels and provides distribution and licensing services to more than 200 independent and major CD and DVD labels. The Naxos Group is also an industry leader in music education boasting a wide range of physical and digital educational products. The Naxos Group’s digital platforms include the Naxos Music Library, Naxos Spoken Word Library and Naxos Video Library subscription services. Please visit www.naxosmusicgroup.com. 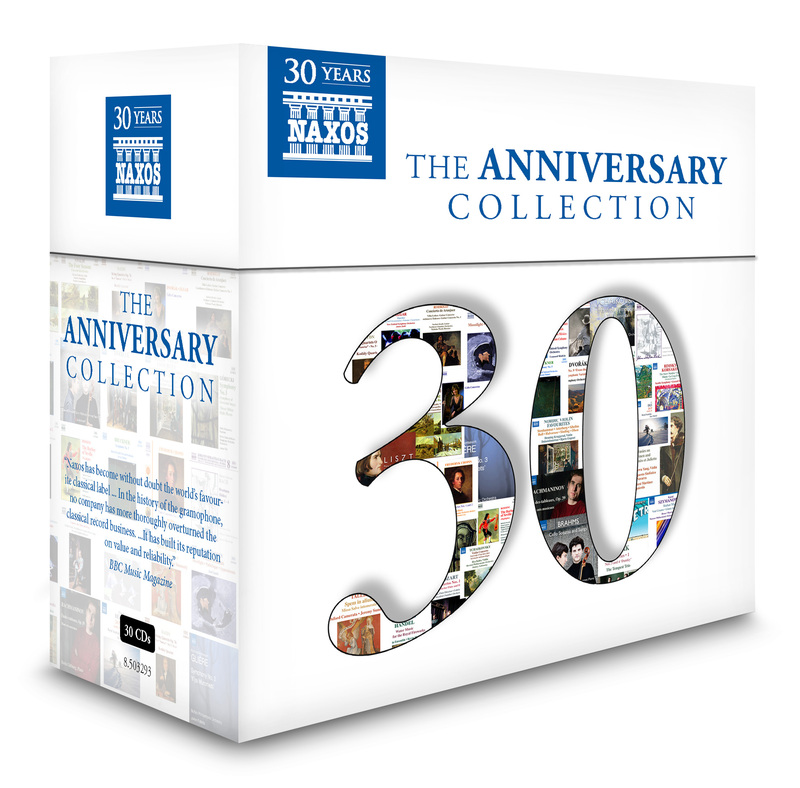 Launched in 1987 and currently offering over 9,000 titles, Naxos celebrates 30 years as the world’s leading classical music label in terms of number of new releases and breadth of catalogue. Its strategy of recording exciting new repertoire with exceptional talent has been recognized with 24 GRAMMY® awards, over 800 Penguin Guide 3-star recommendations, 184 Gramophone Editor’s Choice Awards and numerous other honours. Naxos is a truly international label and produces over 200 new recordings a year in more than 30 countries. Naxos has developed a wide range of educational products and services including the Naxos Music Library; today’s most important classical subscription platform. Please visit www.naxos.com.